Some Frameworks 5 porting, fix HiDPI when QT_SCREEN_SCALE_FACTORS is being set, fix setting (sub-titles) url from configuration dialog. More Frameworks 5 porting, drag&drop fixes, includes fixes for 0.11.5b. Initial Frameworks 5 port, should be on par with 0.11.5a. Support for Qt's animated SVG's and various crash fixes. Basically a back port of the Qt3 support removal for the Frameworks 5 port with some minor fixes. Made the flash support work again with latest libflashplayer and Qt. Double click item acitivation triggered edit item mode. Now it will activate the item. Fix a serious issue with files with non-ascii characters on systems with a non-utf8 based locale setting, it would corrupt the recent.xml. Also some build and package fixes. Fix saving TV list, SMIL synchronization fixes and read opml files. Apparently opml is used too to list multiple RSS feeds. Crash fix for flash player and non-working configure toolbar menu option removed. Two crash fixes, the youtube generator could generate an information page that crashed kmplayer and a XML document with trailing XML fragments also crashed kmplayer. A revert of the in-place playlist item title renaming in 0.11.2. There was no easy way to rename a new group for instance. Support for redesigned youtube with updated konqueror and resolution change fix in the npp backend, opening a DVD with MPlayer now shows the titles on the disk again, the pause button didn't pause list items and local file name encoding fixes. Icon load-on-demand was not visible, started from Dophin with multiple files didn't work and buffering slider didn't disappear on live streams are fixed. Lots of improvement in the SMIL engine, now many of the 2.1 and 3.0 tests play correctly. 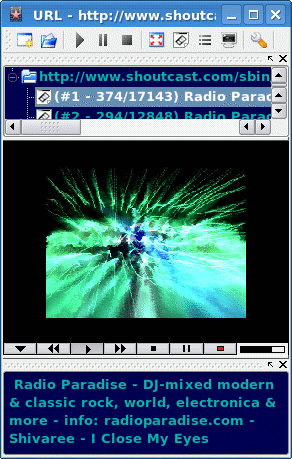 On the porting from KDE3 front, language and subtitle selection works again for the MPlayer player when playing a DVD. Updated translations and information pages of youtube and blip.tv generators fixes. [10 may 2009] Released for 0.11.1 for KDE4. Ported the clear history option and merged the generators from the Maemo port (needs build with cairo and npp support, which are default enabled). Lots of smaller fixes all over the place. [23 nov 2008] First stable release for 0.11 for KDE4. Not that all features from the KDE3 version are ported, but there are no known crashes anymore. The most annoying crash was when starting a drag and drop operation in the playlist. Atom feeds are extended for Youtube queries, e.g. try opening http://gdata.youtube.com/feeds/api/videos?vq=kde4 (the query here is kde4). You need to enable the Netscape plugin support to actually see the flash video.